The quarterback known for doing too many of the wrong things at least said the right ones as he exited the Phantom Zone on Wednesday. Quarterback Jameis Winston returned to the Bucs, and he made it clear that if the team wants to stand behind Ryan Fitzpatrick for the immediate future, well, Winston will stand there, too. and dab guys up and celebrate with them. That's the part that you miss -- that team bonding -- because you do this together. It's tough going out there and getting wins. "I've seen the beards. When a guy throws for 400 yards three games in a row, you've got to love that. And as a community, we've gotta get behind this team, because when we're winning, when things are going good, we've gotta capitalize on that," Winston said. Bucs coach Dirk Koetter still hasn't said who will start Sunday against the Bears, but it's hard to see him benching a quarterback who has thrown for more than 400 yards in each of his first three games with 11 touchdowns. None of that, said Winston, was a surprise. Koetter said it was good to have Winston's energy back in the building but would not commit to a starter. During his time on suspension, Winston said he worked. “I did my best impersonation of what it would be like as an in-season schedule being here," Winston said. "I got the guys from Orlando-area. Fort Lauderdale, Lakeland. Louis Murphy even came out there and threw a couple passes — brought him out of retirement — and we just went to work. I didn’t want the guys in this building to be working hard and I wasn’t out there doing my thing. Other than spending a lot of quality time with my family — because I didn’t have a chance to spend time with my Buccaneer family — we did a lot of great things. After every practice, I catered meals to my (new) teammates just so I could have that team-bonding that I missed here. I feel like we had a pretty good plan together. "I had some coaches come in. I did it like a real thing. I had George Whitfield come in. I had John Beck come in, so I got some individual work. I got my trainer Otis Leverette come in – he’s my personal trainer. We worked hard. I went to work. Like I said, I couldn’t let these guys outwork me even though they had the facilities and everything." 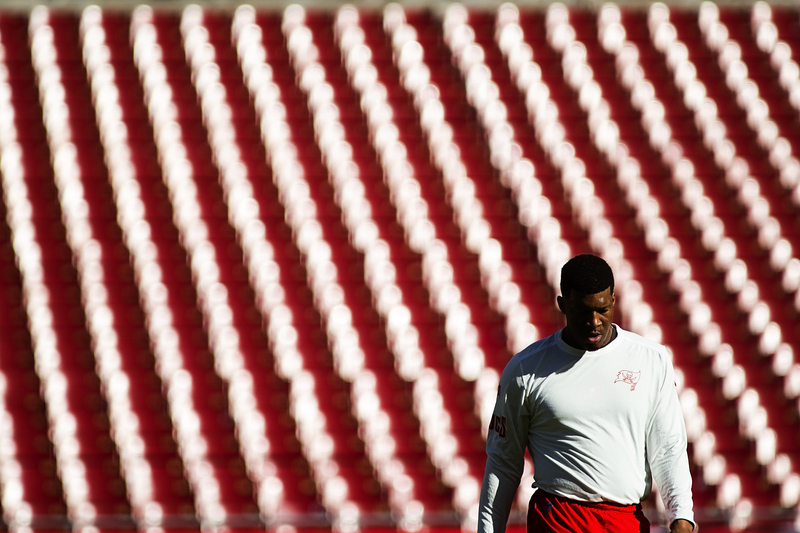 Besides Fitzpatrick playing so well, Winston's return is also hindered by a short week. That matters to Koetter more than the travel to Chicago. “Short week more so than the travel," Koetter said. "The travel is what it is. When you get to the end of the week in the NFL, as you get into Friday afternoon — after your Friday practice, (there’s) Saturday walkthrough, Sunday that’s pretty standard. If you’re going to travel, you’re going to travel. First part of the week — just now we were out at practice — we‘re only at 41 hours after a very physical football game where these guys played hard, got home late — probably some later than others. Didn’t get much sleep that night. Instead of the two days of recovery, we had just one day and we were back at it today." For the Bucs, the injury to safety Chris Conte leaves the team with three rookie defensive backs playing key roles -- cornerbacks Carlton Davis and M.J. Stewart and safety Jerome Whitehead. "I think all three of those young men are really good football players," defensive coordinator Mike Smith said. "Of course, Carlton has probably got the most snaps of the three guys. He’s a big, strong corner that plays well when he’s close to the line of scrimmage than when he’s off. I think that we’re seeing that as the games start getting put into the books. M.J. has some flexibility in terms of where he can play. He’s lined up and played corner, nickel and safety for us. He’s a guy that’s got flexibility and then we’re just getting these young guys – as quickly as we can – up to speed. Every day is a new day for those guys, but we’ve been very pleased with how they’ve worked for us thus far. They’ve been battle-tested that’s for sure. You face two Hall of Fame quarterbacks and a guy that was MVP of the Super Bowl, so they haven’t had any slack. That’s for sure. The Bears' strength, however, is not in their passing game. It's in their running backs (Jordan Howard and Tarik Cohen_ and one of the best defenses in the NFL. Are they good enough to stop the league's top offenses in the Bucs? Sunday, we'll see. Winston, too.